Although 1 January 2014 was supposed to be the day after which all new coaches purchased would have to have Euro6 engines, it became evident long before that operators would be able to continue buying new Euro5 coaches for some time thereafter, indeed well into 2015 and even beyond if the possibilities of our certification system are maximised. Nevertheless, Euro6 powered vehicles will increasingly become the norm as time progresses and Volvo has begun bringing in early examples of the new generation. 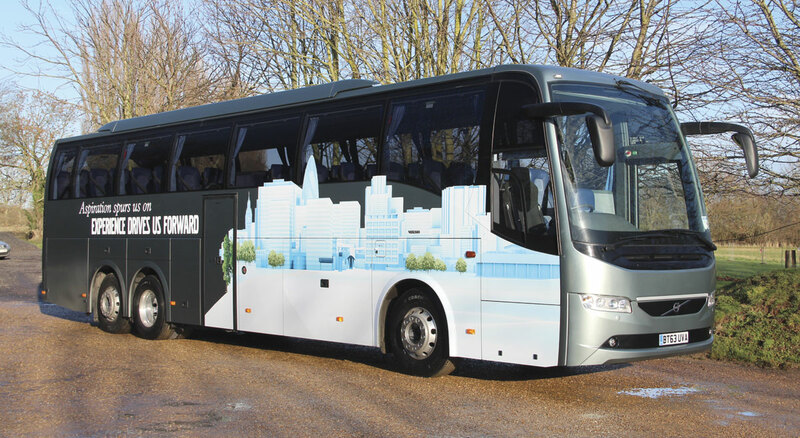 The first of them to be made available for testing is a tri-axle 13.05m Volvo 9700 which carries a special livery for the role. Vinyls on the side proclaim: ‘Aspiration spurs us on – Experience drives us forward’ on the offside and ‘Making a virtue out of Euro6 – Enhanced comfort, performance and lifetime value.’ Norman Thomas, Product Engineering Manager for Volvo and Oliver Walker, Vehicle Coordinator for Volvo Coach Sales, brought the demonstrator over to the Somersham headquarters of Dews Coaches where the B&CB test team of Simon Dew, Andrew Fowler and myself took a closer look at her. The 9700 first appeared in the UK in 2005 though similarly styled coaches had been available in Nordic markets since the early 1990s. It and the similar 9900 model, which has a sloping window line to match the theatre style seating and is not offered in the UK, received a major facelift in 2007 when the original styling was replaced by a more angular design with a front grille that emphasised its membership of the wider Volvo family. In this guise it was awarded the International Coach of the Year 2008 title. Although it is a completely Volvo built product, the 9700 is effectively still a body on chassis combination that is now mounted on the B11R 6×2 IFS chassis. Both the body and chassis are assembled at the Wroclaw plant in Poland, which is now the main location for 9700 production, although manufacture of examples for the Scandinavian market is subcontracted to Carrus in Finland. Three length options are produced. The two-axle model is 12.35m long and there are two three-axle variants which are 13.05m and 13.83m long respectively, though Volvo refers to them as the 13.1m and 13.8m models. All high deck models are 2.55m wide and 3.56m high (3.74m over the air conditioning unit). With Euro6, not only has the 13-litre D13C engine unit been replaced with the 11-litre (10.8-litre) D11K, the model has undergone a further restyling exercise and a number of other enhancements have been introduced. Volvo stresses the greater efficiency of the coach and, stripped of superfluous complication, even the name is now more streamlined. No longer are we supposed to refer to the UK version of the model as the 9700 Prestige Plus, few of us had any idea what that was all about. It is now simply the Volvo 9700, which is what we always called it anyway. 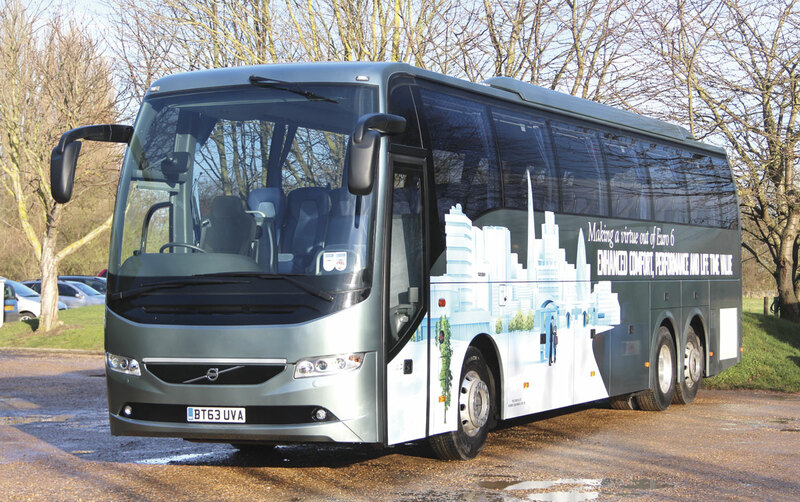 The D11K is now one of only two engines offered in the Volvo coach range that at Euro5 had seen seven, nine, 11 and 13-litre alternatives. The other new power unit is the eight litre D8K. 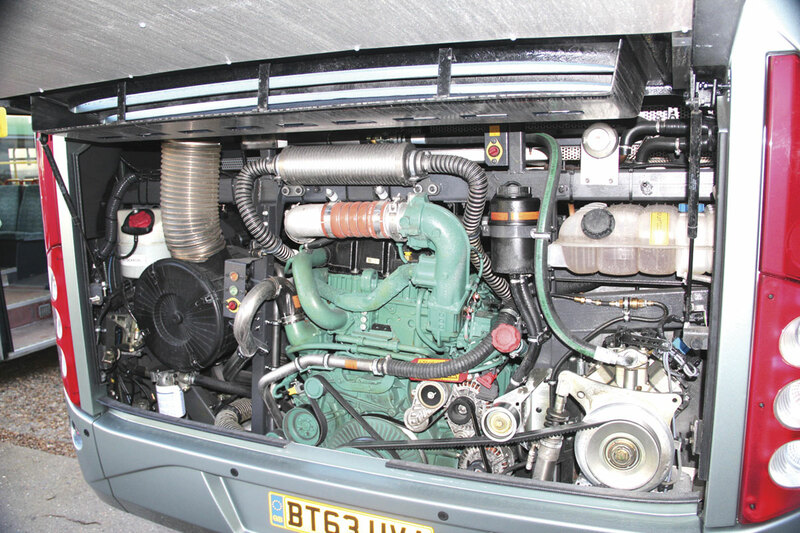 The D11K is an extensively reworked version of the Euro5 11-litre unit which has been offered relatively briefly. It is a six-cylinder in-line engine with an overhead cam, four valves per cylinder and, in a change from the previous generation, common rail injection. 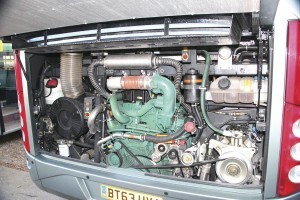 Previously the Euro5 11-litre had unit injectors. The switch to common rail enables higher pressures to be achieved, which in turn means better combustion. It is available with three outputs: 380hp (280kW), 430hp (316kW) and 460hp (339kW), our test coach having the top of the range D11K-460 which delivers maximum torque of 2,200Nm at 1,000-1,400rpm. At the same engine speed the 430hp variant produces 2,050Nm. 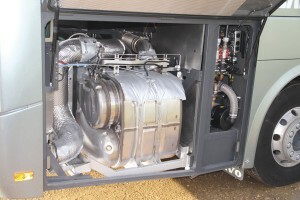 Euro6 legislation is all about reducing emissions and the task the manufacturers have been faced with is considerable. Crucial to the cleaner burning processes is the requirement for the engines to operate at higher temperatures. To this end the engine management system (EMS) will work to keep the exhaust as hot as it can. An example of this is a butterfly valve on the inlet manifold that, controlled by the EMS, will increase back pressure and thereby raise the engine operating temperature. In total, the Volvo Euro6 11-litre system has 11 sensors on the engine and six in the exhaust. I know of one competitor with 42 sensors on its system. Unlike the Euro5 version, which had the exhaust emissions controlled using selective catalytic reduction (SCR) alone, the Euro6 combines SCR and an exhaust gas recirculation (EGR) system. Norman explained that it is ‘hot EGR’ on the 11-litre engine because it is non-cooled and is therefore a relatively simple system. Effectively, the EGR is only required when the engine is cold. This is a contrast to Volvo’s five and eight litre units, both of which have cooled EGR along with SCR. The one box muffler design. Along with the EGR and SCR systems, the Euro6 9700 has a new design of exhaust system featuring a single box muffler which comprises a diesel oxidisation catalyst (DOC) and a diesel particulate filter (DPF). The DPF collects soot and is an additional item requiring maintenance in that it will need cleaning periodically. How often it requires attention will depend on the duty cycle. The driver receives plenty of advance warning about the situation because, a pressure sensor within the exhaust monitors the back pressure and triggers a warning light on the instrument display screen when it is close to needing cleaning. There is now a regeneration function included in the exhaust system that will burn the particulate matter collected, turning it from soot to ash, a process that requires no intervention on the driver’s part. To enable regeneration to take place, an extra injector is mounted in the exhaust system and when the diesel from it ignites, it raises the temperature within the exhaust system which burns the soot. It will continue to do this, as necessary, until the filter becomes filled with ash, which is when the filter will need to be cleaned. Should regeneration not take place passively, that is when the vehicle is moving along the road, the system will try again. If it fails to regenerate passively ten times, then active or forced regeneration will be necessary. This needs to be done in a workshop, though it can be done in any workshop; it isn’t necessary to take it to a Volvo dealer. It involves lifting the engine revs to the point where the conditions within the DPF are right and then injecting the diesel. This process takes between 30 and 40 minutes. There may be a case for undertaking a forced regeneration at the same time as an oil change. Incidentally, if you are nearing the end of your journey when the regeneration process starts, and you then arrive at your destination and stop, the regeneration will also stop, registering on the system as a failed generation. This interruption does not do any harm; the system will simply try again when it can. Cleaning the filter is an industrial process involving the removal of the filter from the exhaust system. Norman confirmed that Volvo will shortly be rolling out details of the arrangements for an exchange filter offer via the Volvo network. Regeneration will normally take place within the exhaust. The hotter the exhaust is, the less frequent the need to regenerate will be. As Norman put it, ‘Coaches on express and touring work will need less regeneration than those doing London sightseeing.’ He could not say what the minimum period a filter would take to become completely full was, but it would be much longer than for a city bus. As you would expect, given its success to date and the fact that it is produced in house, Volvo is offering the I-Shift AT2142E automated manual transmission as standard. This is the same Generation-D system already used in late Euro5 B11Rs. 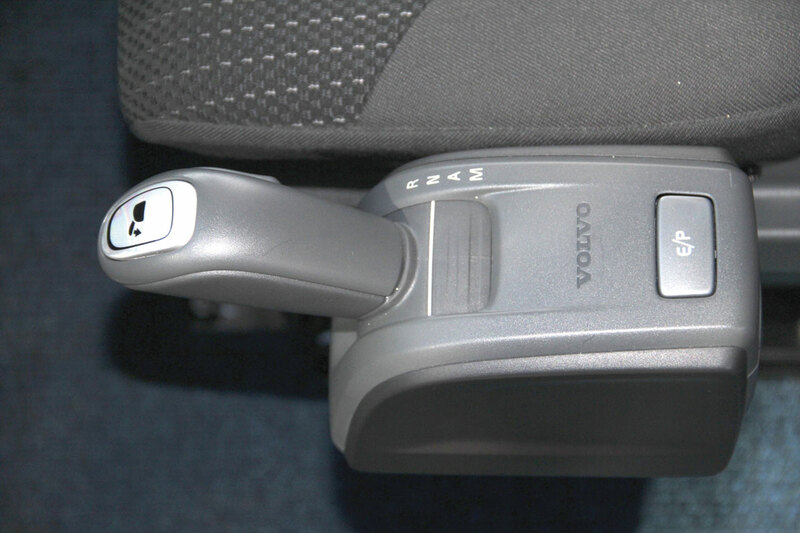 This version can be supplied with or without manual selection switches, standard for touring coaches being with them, though drivers will invariably put it into automatic and leave it there. There is now an alternative to the I-Shift, but only in conjunction with the 380hp version of the engine (which develops peak torque of 1,800Nm at 950-1,400rpm). This is the ZF Ecolife 6AP2000B six-speed fully automatic transmission with Topodyn. Operators undertaking a lot of city work, such as those in London, might find this a useful option. 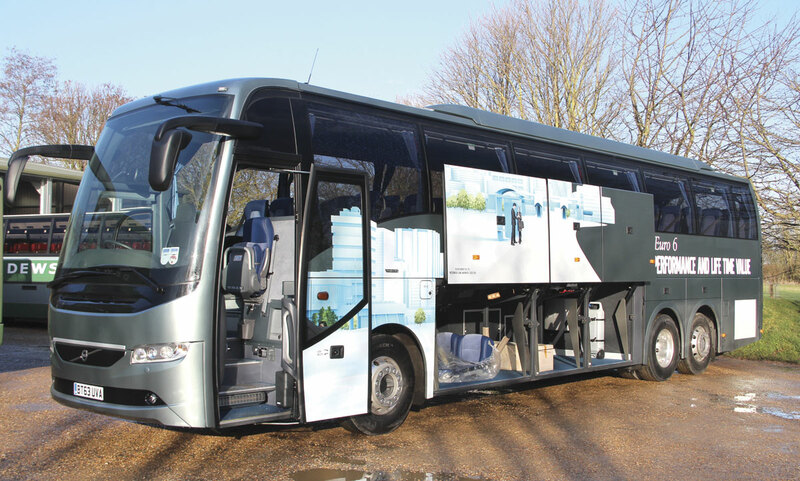 The first examples of the B11R ZF automatic combination are a batch of five 15m Elite-i coaches just placed in service by the Oxford Bus Company on its express operations. Our coach had the I-Shift. Other elements of the mechanical specification include: the Volvo IFS independent front suspension system, the RS1228C drive axle and a hydraulically steered tag axle that locks at a fixed speed. A differential lock is optional. A beam front axle will be available as an option on B11R 6×2 chassis whilst all 4×2 Euro 6 B11R chassis will specified with the beam axle. ZF hydraulic power steering is fitted and the maximum wheel angle is 53 degrees. Four air suspension bags are fitted in the drive axle and two each on the front and tag axles. Fuel tank capacity is 600-litres while the AdBlue storage capacity is 64-litres. The brakes are discs all round and ESP, ABS, ASR and electronic braking (EBS5) are standard along with brake blending, hill start aid, temperature and poor performance warnings, brake assistant and automatic calibration after brake pad change. The hill start aid, better known as hill hold, now comes on automatically without the need to press a dash button every time because it always defaulted to off when you turned the ignition off. As before, the electrical system is Volvo’s BEA2 system with enhancements to accommodate the engine management system. Within BEA2 there is now what is known as an ARMS system, an acronym for automatic reset of the main switch. This monitors the lights and if they are left on too long it shuts the batteries down so there is no longer any need to invest in a separate battery protection system. 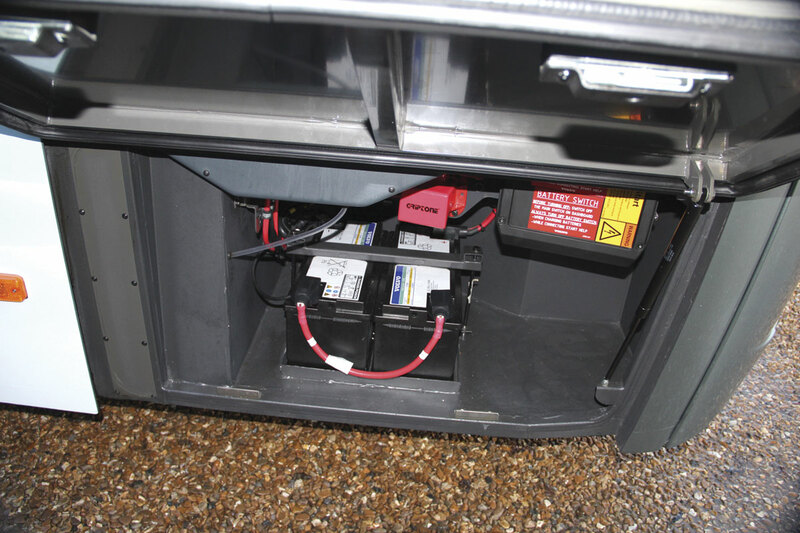 New and potentially very beneficial is the I-Start battery system which was first developed on the B9TL double deck and has been carried over as a standard fitment across the range, indeed there is no delete option. It comprises two separate battery systems, one driving the consumer electrical systems and the other one solely for starting the bus. The idea is that the engine starting batteries are always charged so you will never be unable to start the bus for a lack of battery power. Despite there being four batteries in total, two for each system, the total package is lighter than the previous one. In place of the two 225Ah batteries there are now two 105Ah units for the consumer systems and two 35Ah units, no bigger than a car battery, for starting the coach. 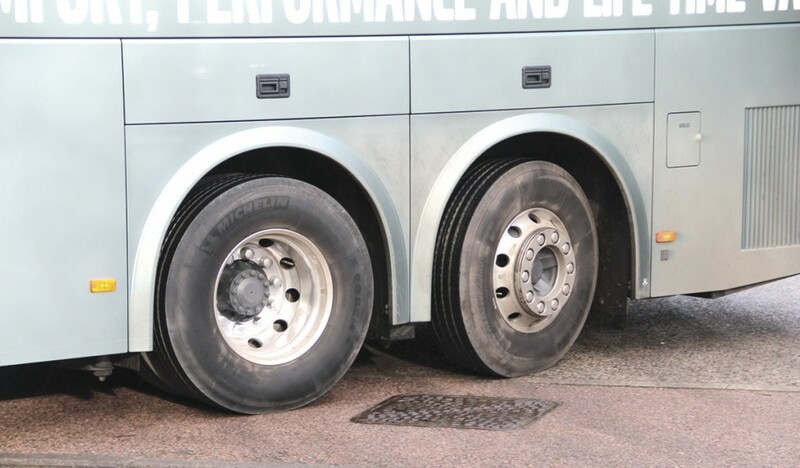 I had expected the coach to be mounted on 315/80R tyres but it actually had Michelin X-Coach 295/80R tyres because Michelin offer this size with a 7.5-tonne load capacity in conjunction with nine inch rims. They are lighter than 315s. The design GVW of the 13.1m is 24,750kg, though I was told that a 26,500kg alternative can be offered in conjunction with a specially uprated rear axle. The unladen weight was 15,560kg, with all fluids topped up. Norman told me that under the same conditions a similarly specified Euro5 9700 would weigh 15,940kg, representing a worthwhile saving of 380kg.